There only a few days left for this one–so if you’re interested be sure to get your work in now. Each day the boundaries of mobile art are pushed, expanded and explored. The creativity, intelligence and spirit of IPA have brought us together: it goes without saying the competition will be steep. So take this opportunity to challenge one another. Push harder. Discover more. Watching this community grow has been a daily inspiration – so it is an honor to start giving back. 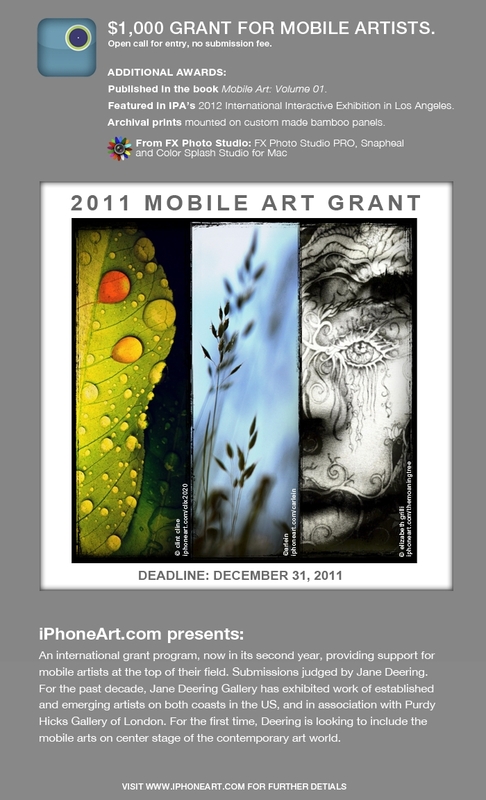 The 2011 IPA Mobile Art Grant will award $1000 to the artist with the best work. A spot in our Los Angeles 2012 exhibition and inclusion in a book of the best work of 2011 will also be awarded. IPA is a place to show your very best work. And now is the time to show it. This entry was posted on Wednesday, December 28th, 2011 at 22:05and is filed under . You can follow any responses to this entry through the RSS 2.0 feed. You can leave a response, or trackback from your own site.